I used a 12” pizza pan to make this pizza. The TraderJoe’s Pizza Dough calls to remove the dough from the package and let sit at room temperature for 25-30 minutes. Do this first. Once the sauce, veggies, and cashew cheese are prepped the dough should be ready for you to use. 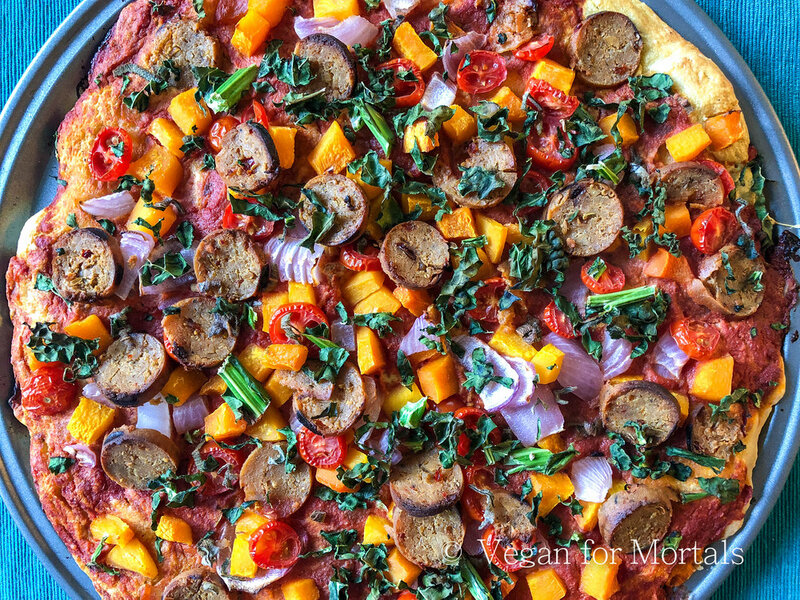 Chop the red onion and butternut squash and add to a silicon baking mat on a baking sheet and roast at 400 degrees in your over for about 25 minutes. In a large pot on your stove, cook the diced onion in 1/2 cup of water for about 5 minutes. Add in the garlic and cook another few minutes. While the onions and garlic are cooking, combine the diced or crushed tomatoes and the tomato paste in your Vitamix, food processor, or blender, and blend for about a minute. Pour the sauce over the onions and garlic and add in the dried basil and oregano and let cook while the veggies are roasting in the oven. While the veggies are cooking, fill up a 1 cup measuring cup with raw cashews and then fill with water over the cashews. Add this to your Vitamix, food processor, or blender with the nutritional yeast, garlic clove, and an additional 1/4 cup of water. Blend until smooth. Spoon some of the cashew cheese over the dough and spread out. Then spoon some sauce on top of the cashew cheese and spread over that. Top with the roasted veggies, chopped kale, sage, cherry tomatoes, and sliced Field Roast sausage. Bake at 450 degrees for about 20-25 minutes, checking to make sure the crust is golden underneath (you may have to remove the pizza from the pan and place directly on the rack). Remove from your oven and let stand for 5 minutes before cutting and serving.